These are a few of my favorite things. Check them out. Chef Dillion Graham has his stamp on the best fine dining menu in Chicago. Photo: Facebook/RoysChicago. Chef Roy Yamaguchi of Honolulu, Hawaii has partnered with Chef Dillion Graham to bring the Asian-Pacific Rim fusion cuisine Yamaguchi made famous worldwide to the American Midwest. Located at 720 N. State Street, Roy's Chicago is an oasis of Hawaiiana in the heart of downtown Chicago. Among my favorites are the Hawaiian tuna and salmon poke with crispy taro chips as a starter, and butter-seared Georges Bank sea scallops with creamy coconut black rice with lobster essence as an entree. There's also a great lump crab fried rice to go with coconut green curry Prince Edward Island mussels. Roy's features an assortment of signature sushi and a host Pacific Rim-inspired cocktails. Try the Paradise Found served in a copper pineapple. Best fast food in Chicago is hands down, an order of Portillo's Italian beef. Photo: Facebook/Portillos. When my high school friend Jen May Pastores, a California and Hawaii photographer, came to visit me, she wanted a taste of Chicago. I didn't take her to get deep dish pizza or Chicago-style hot dog—though you should get one from Supwerdawg in the city's northwest side. If you want a taste of Chicago, you have to eat an Italian beef sandwich. It's a Chicago institution—invented by working-class Italian immigrants who needed an affordable way to feed large crowds at family gatherings or community events at the neighborhood church hall. Thin slices of Italian-seasoned beef, slowly simmered in a garlicky broth, is placed on an Italian bread roll split lengthwise. True connoisseurs garnish it with giardiniera and drench the whole thing in the "hot juice." It's definitely a messy feat to finish, but many of us have come up with creative ways to eat it without getting it all over. There are many awesome Italian beefs in town but my go-to has been Portillo's. Best fresh kimchi in Chicago is at Bop N Grill. Photo: Facebook/BopNGrill. Eating healthy is hard but finding a go-to condiment that is versatile and can be used in a variety of ways can make it so much easier. As a largely plant-based eater, I love kimchi. The average American has to get used to this ubiquitous Korean banchan, but luckily I grew up with it in Hawaii. It's difficult to find fresh, locally-made kimchi in Chicago—unless you make it yourself at home. 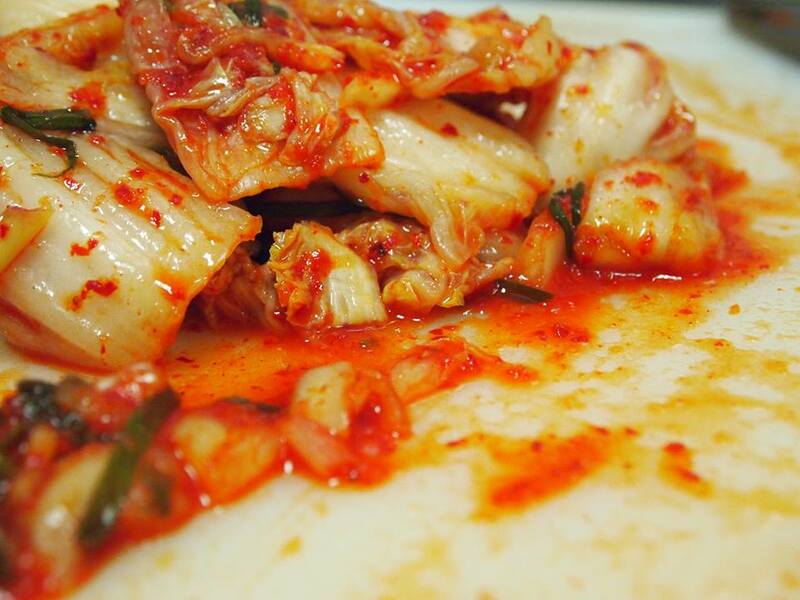 My favorite go-to kimchi is sold at Bop N Grill, a fast-casual Korean eatery featured on Diners Drive-Ins and Dives, Men's Journal, and Chicago's Best. This kimchi has a fresher taste than your overly-preserved jarred version from H Mart or Korean grocer—just enough of a refreshing crunch to pair with its perfectly-leveled funky fish sauce saltiness, sour and spice. Do what I do. Buy a jar. Eat as a side dish, or alone, over steamed brown rice. I've used it to top sandwiches, soups, and salads, and french fries, too. If you're really adventurous, ask for my kimchi fried rice recipe.